Pollinator Posts is a periodic newsletter sent to anyone interested in following the development of the Mono Pollinator Garden. This includes volunteers, sponsors and anyone else who is interested in the garden and pollinator health in general. To subscribe to Pollinator Posts, please email ralph.manktelow@townofmono.com. The plan for this spring and summer has been prepared by the planting group and can be found in the minutes of last Friday’s meeting. Please see included minutes and sketch of site. We have 3 suggestions for naming our site and instructions are listed in this mail. Please make your choice by Wednesday and we will add up the votes. Here is an interesting Ted Talk on pollinators and the four main factors that are affecting them: diseases, pesticides, agricultural monocultures and loss of habitat. It was done in 2013 so many of you will already have seen Maria speak. The purpose of this meeting was to make plans for the planting season. Dave Warburton outlined his concerns that the planting site be as weed free as possible - particularly that we make sure that we are rid of grass root systems. He emphasized that it was essential to give the new plants – both plugs and new seedlings, a chance to grow and develop their own strong root system with minimal weed competition. With a good take, the new plants they should be able to out compete weeds in 3 years. He feels that the soil at our site is not yet ready for planting. The options for further weed control are either Round Up, which we do not want to use, or continued tiliing. We began tilling last spring, initially by plowing and then repeated discing, and carried on into the fall. Obtaining timely tilling was an issue, which has led to the conclusion that we need to have our own equipment. The tilliing options are discing or rototilling. Discing with a large tractor and set of discs will be a challenge to manouever around the mounds and the trails. The preference is to buy or borrow a lawn size tractor that could pull a small set of discs or a large rototiller. Dave talked about the hedgerow concept for the west margin of the site. The advantage of a hedgerow is that it provides wind protection, protection for small animals, birds and pollinators and provides an important vertical dimension to the site. Stakes were placed last year for a suggested tree and shrub planting species and locations for the hedgerow. Plant all of the woodies – trees and shrubs - early in spring – Dave to obtain pricing from Connon. Have a major work party and hand dig the hedgerow on west side (5 X 85m) m to remove all grass roots for spring planting. Plant the mounds (3) this year and hand weed through the season (these areas are mostly imported topsoil and will likely have some weed seeds. Consider a nursery possibly just south of the holding garden to develop plants from plugs and seeds for transplanting to the main site in 2018. Repeated tilling of all the rest of the site except the mounds and hedgerow strip throughout the spring summer and fall. Watering - Matt and Mike to develop a watering plan which will provide water via sprinklers to all planted areas. Entrance Arch with name - consider placing this on the laneway to the site and close to the 5th line - for visibility from the road. Dave to construct and Ralph to provide logs. Organization of planting. General principles by Dave. Divide all of the area to be planted this year into 5-7 regions –each region is to be under the guidance of one chief who decides what is planted where. I.E, the chief makes the detailed planting plan with the plants being from the selection of the planting group and Dave. Each region will feature a couple of specific plants as feature plants for educational purposes. Have a similar process of regions and chiefs for the remaining areas next year. Finance: There is approximately $12,000 available and we have applied for grants of $20,800 which could become available later this spring. Our fundraising will become more active in the near future. Private donors can make a donation and get a tax receipt from the Town of Mono. We have partnered with Nottawasaga Valley Conservation Authority in applying for an Eco Action Grant. We have submitted a Grant application under the MNRF for a Stewardship and Habitat Restoration Grant. We are in the process of applying to Dufferin County for funds for a 150 project related to the educational component of the Pollinator Preserve. The planting sub group is meeting this week with David Warburton to make plans for what plants go where. We had four additional volunteers in January. This makes it 38 people. This is wonderful. We can use all the help that we can get with planting and plant care! If you were able to attend the End of Season Get Together at Sharon’s you might remember that we agreed to proceed with a review of name selection for our planting area. It has been suggested that Mono might be the first word i.e. Mono Pollinator Garden, but that is optional. Some volunteers have indicated an interest in being a part of a fundraising group. If anyone else is interested please contact us. We are going to meet in a couple of weeks for our fundraising planning session. We are particularly looking for local area corporate sponsors. If you have any suggestions for possible donors please contact one of us. Better still if you have a personal contact in a local business please let us know. We recognize and thank the Town of Mono, which has generously provided the pollinator site and$5,000. Repeated tilling with plow and disc to established some weed control - by Sunshine Landscaping. The Plant Selection Group (Helen Derry, Donna McAvoy, Rosemary Reid and Jutta Holden) created a planting list – planting to be started in the spring. 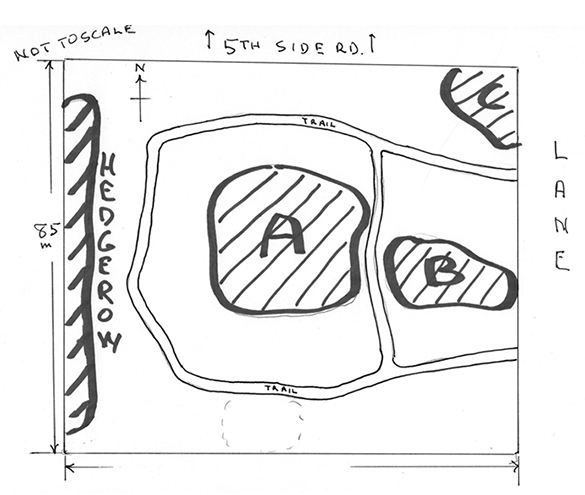 David Warburton, landscape architect laid out the master site plan. The walkways were created by Sunshine Landscaping by removing topsoil and replacing with hardwood chips as a walking surface. The Town donated large boulders as landscape features. Using imported topsoil three low hills were created to provide varied terrain and areas for plants that prefer drier soil. We did hand grooming with shovels and rakes. The planned location of 40 trees was staked out for spring planting. An 800 sq. ft. holding garden was created and our volunteers group contributed 150 plants. A 600 sq. ft. planting of flower seeds was done in November. We are applying for an Ont. Land Stewardship and Habitat Restoration Program Grant. The Town of Mono has offered additional $5,000 cash as partial matching funds for the grant application. Select a permanent name. The working name is the currently The Mono Pollinator Preserve. Flesh out the volunteer interests – particular needs are for spring planting and for community fund raising. This was created by Dave Warburton who spent most of Tuesday on the design. Dave has emphasized that the plan is flexible and it is ok for us to tinker with it as we wish. Please keep your ideas coming. The features of the Plan to date is a trail system, earth mounds and groves of trees - but really, you must come and see it for yourself! The main trail system is a large loop which leads out and back. It is 6 ft. wide, with an entrance and an exit to the laneway. There is also a mid site trail that joins the north and south arms of the loop. In addition there will multiple narrow dirt footpaths leading off this loop. These paths will allow walkers more intimate contact with plantings and lead towards some instructional signage. I think that it will be quite fun to walk these trails. There are two irregularly shaped mounds running east and west in the center of the site and a third mound at the NE corner. The purpose of the mounds is to provide raised areas for plants that require drier soil and to give visual variety to the otherwise flat site. In the largest central mound there will be a clump of black locusts, boulders and a bench for sitting. Dave has selected ten locations for small groves of trees and suggested fourteen different trees for the site. All species are valuable for pollinators and bird life. Along the west boundary will be a hedgerow of about 20 trees and shrubs, which will act as a windbreak and a refuge for pollinators. This unit will also help to frame the west side of the site and separate it visually from the adjacent fields. A heavily mulched bed around the trees will help to limit weed growth from the fields to the west. Each grove will be a grouping of the same type of trees with each placed about the perimeter plus a couple of groves placed centrally. This was done later in the week, Sunshine Landscaping moved in a front-end loader- (see pics) and removed the topsoil along the trails and then filled them in with wood ships as our walking surface. Wood ships have been donated by the Town of Mono and Williams Bros Tree service. The soil from the trails provided some of the soil for the mounds. The Town of Mono provided additional topsoil that had been stored at the Klondike Pit. I don’t have the final figure – at least 25 dump truck loads! Our only cost will be the labor of loading the trucks and transporting to the site. Thanks to Mike Dunmore and Matt Doner for organizing this mammoth move. The mounds are 18-24” high and are designed to be not too steep for continued use of mechanical equipment. We were impressed at the large amount of soil that was needed for these relatively small elevations. Sunday Oct 16 – 9:00 am. This is a good time to bring plant donations for the Holding Garden. . Sharon and/or Helen will be at the site. Water is available from the tanks on site or the tap at the back of the house to the east. Please check your list (appended) for the selected plants. Other good pollinators plants are also welcome. As an anti weed campaign; tilling will continue to be done until the ground freezes. In order to assess the spring wetness of various parts of the site and hence what plants should go where, the plan is wait for spring for planting and seeding. Hand grooming of the site. We need to smooth out some of the site and do some work on the trials with shovels and rakes. This will be done when the mechanical work is done and Ralph returns in a week’s time. We can put our heads together and select some times that work for anyone who is able to help. We have some potted trees (15?) that need to be dug in for winter protection. 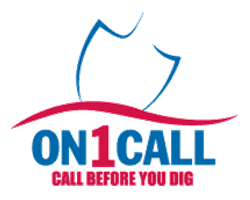 Select locations and place boulders, stumps and logs. Decide which plants should go where --sometime later. The plan is to create the site’s landscape architecture. Monday – Dave Warburton will do the on site planning. Tuesday – Hopefully the beginning of earth moving by machine, likely with a skid steer. - Beginning of hand work (shovels and rakes) to smooth out the surfaces of mounds, berms and trails. Thursday and Friday - Will be planned as needed - likely further hand work. Friday Oct 14 at 9:00 am and Sunday Oct 16 at 9:00 am - Anyone can bring their plants to the Holding Garden (at the Pollinator Preserve site) Sharon and Helen will be at the site. Or, bring your plants at other times that work for you and dig them in to the Holding Garden. Since we last met as a group we have had an additional tilling of the plot. We would have liked to have more frequent tilling but Sunshine who was doing it was unavailable. And so we had a nice “crop” of wild mustard throughout the plot some of which looks like it has gone to seed. It makes one wonder where it all came from!! Anyway with the recent tilling the topsoil and lack of weed growth looks very good today. The Plant Selection Group (Helen Derry, Donna McAvoy, Rosemary Reid and Jutta Holden) has held their first meeting. More information to come shortly. The next step is to disc the plot one more time likely near the end of next week. Following the discing we will do the architectural layout with David Warburton’s leadership and then promptly move into the creation of the site. Creating the site will involve creation the planting areas with various elevations (mounds and berms), a trail system and the placement of boulders, logs and stumps. This stage will be done with some earth moving equipment plus handwork with shovels and rakes etc. We will get a better idea of when this stage will start and get back to all of you. The more help the better for this stage. The next step will be to decide which plants go where. Rooted plants will be put in next spring and seeds will be done before snow flies – or we are in trouble!! Re: The Holding Garden –The concept is that for some plants it is easier to identify them in the fall and donate them “now” than in the spring. Helen’s group will be getting a list out to everyone shortly – the plants that the selection group has chosen and the process. The plan is to pot your donation from your own land and bring it to the site for fall planting in the staked out nursery area. More info to follow from Helen and her group. Action: The working name is the currently The Mono Pollinator Preserve. We would like to settle on a permanent name and are asking you to send in your suggestions. Maybe we will need to vote on this!! ?